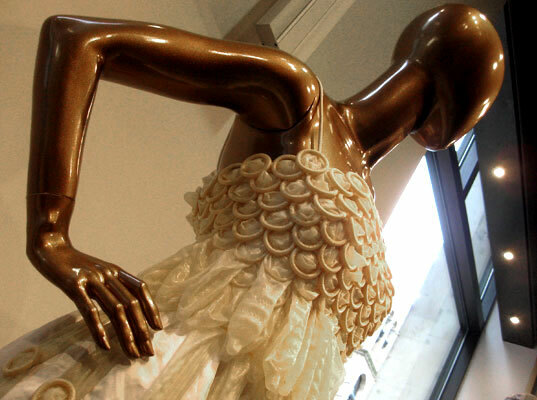 When Life Hands You Expired Condoms, Make a Dress! Now a college senior, Kaywin acquired the condoms three years ago and made two dresses and a coat. Her boldness goes beyond being open about using condoms as art: She’s actually worn these outfits in public. (Definitely NSFW territory.) Laughter and disgust are the usual responses, she notes, but some people actually compliment her style. These rubbery fashions were on display at the NYU Gallatin School of Individualized Study’s “Eco Fashion Week” in January. We’re pretty sure our college professors might have kicked us out for this idea, so kudos to Gallatin’s faculty for being so open-minded. What do you think? Sound off in the comments below. About twenty years, in Tucson, Arizona, I went to a fund-raiser dinner/dance for the local Planned Parenthood. It was called "The Bolo Ball" (a bolo is a type of neckwear worn in the south-western part of the USA in place of a standard men's necktie or bow-tie and a version is popular in Munich, Germany, I think, too) and prizes were given out for "The Most Original", "The Most Expensive" , "The Most Colorful", etc. I took expired condoms from my husband's medical practice, opened and unrolled several to create the bolo "strings", and then used a still-wrapped condom to make the tie "clasp" which sat directly at my neckline. After the prizes were awarded, the judges announced that a new category had been created. Its title was "Most Appropriate to Planned Parenthood's Mission", and I won!! I went up to the podium to accept my prize and, yep! you guessed it!! It was a box of a dozen UN-expired condoms... in fluorescent colors! Hi Ryan, Tks for your post I was the pionier, I have beem work with condoms for 15 years and many students around the world copy me, I think its cool the most importa messenger is prevengion against hiv aids...sorry my poor english! i really think these dresses are cute. maybe a little gross, but she used a unique idea, all in the spirit of being green. i think the concept could be carried out a whole lot more often. my favorite is the yellow dress, i really like the top, because it reflects the trends in a unique way. i wish she had continued the skirt the way she did the bodice but it still looks cool. i'd be game for wearing one. When New York University student Emma Kaywin realized that a pile of expired condoms from her HIV Hotline internship were going to the landfill, she asked if she could use them for an art project, instead. Our first instinct was to squirm a little�don't worry they're not used�our second was, "cute dress!"